Sure enough! Curry is the best. The recipe of our original curry is Version 3.1 now. Our method for curry base is to use a lot of onion, instead of the English style, which uses roasted wheat flour. In one of the issues of "Kurashi no Techo" magazine and "Asahi" newspaper in the 1980's, the curry recipe used in the 'Nile Restaurant,' an Indian restaurant in Ginza, was introduced with which our curry is based on. Add a few drops soy sauce for finishing. The recipe is introduced by Mr. Yoshio Marumoto. In this version, I have mastered clear chicken bone soup stock with oil removed. So far, in my opinion, this method is the best. The oil-removing-method is excellent! The bases of both version 1 and version 2 are the method which uses lots of onions. I used to thinly slice 10 to 30 onions. However, it was a big hassle. Even when using a very sharp knife, it was difficult to avoid tearful eyes. So I used to wear a pair of swimming goggles while I sliced onions. However, in version 3, there is a breakthrough: Slicing onions with a food processor. I was impressed with this idea and so I wanted to buy a food processor very much. The specific one that I needed is the one for commercial use only, not sold in neighboring department stores, neither in Fukuoka nor Kitakyushu. It is also expensive, about $500 (52,000yen). I was hesitant. Eventually, I decided not to buy it. Now, I am using a mixer instead of a food processor when I mince onions. After that, I saute the minced onions with ghee for 1 to 2 hours. Remember that the oil has to be ghee and the soup stock, of course, is based on version 1 and 2.
curry powder mix available at stores: For 5 to 10 plates (desired amount but, only use 1/2 to 1/3 of normal use) If possible, do not use at all. How to make soup stock First, wash the chicken bones thoroughly and add them to a pot (stock pot) of boiling water. Continue boiling for 2 or 3 minutes and then turn off the heat. At this stage, there is a lot of "residue (skim the broth)." It is a good practice to remove the residue before the next step. After turning off the heat, drain the water, remove chicken bones and rinse the bones thoroughly in water. Especially, the remaining internal organs should be cleaned off. (Note: Normally, we would skim the broth while boiling, but switching to this method makes the broth very clear. An extra step is required but I recommend it!) Fill the stock pot with water and add the chicken bones and knuckle of veal. Bring to a boil and then add the vegetables and bay leaves and simmer for 2 hours. Then, remove the vegetables and add the peeled lemon (because of residual agricultural chemical in the skin) and simmer for one more hour. Add a dash of salt and after you have cooled and strained the stock, pour it into a empty milk carton. Freeze the cartons of stock in the freezer. Due to the weight difference, the lighter oil separates and floats to the top of the carton. When using the stock, the oily part should be removed by running water or hot water. Then it should be melted so that you can have a very clear chicken bone stock (without oil) will be ready to use. Using this stock to cook Chawan-mushi, a custard-like steamed egg dish, makes the dish a luxurious restaurant class. The stock provides the strong taste of the curry. Usually, I prepare 6 to 8 cartons of frozen stock at one time. One hour before cooking, remove the meat from the freezer and sprinkle a desired amount of curry powder (2 to 3 tablespoons) all over the meat. Slice onions coarsely and mix with finely sliced garlic and ginger using a food processor or a mixer. Pour lots of ghee or ordinary oil (if you don't have ghee) and saute 1 to 2 hours continuously on low heat. Make sure it doesn't burn. I always do this task on a Saturday evening while drinking Sake and sweating. The onion creates the thickness of the curry. Please use a lot of onions. By the way, the sauteed onion can be frozen in bulk. I usually make 3 times as much as I need for one recipe and freeze the rest. Once you have soup stock and the frozen onions in hand, cooking curry is so simple! How to saute onions: Saute them patiently until they turn brown. Once you have soup stock and the sauteed onions, the base of the curry is prepared. 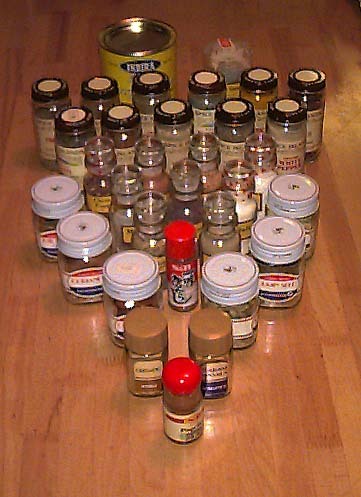 If you want to be more professional, you can blend your own spices, but I cannot really do that now; it may be happen in version 4 or 5 of my recipe. Then, the meat and carrots are added to the sauteed onion and sauteed well. Add hot soup stock and just simmer for 1 to 2 hours. If you have whole coriander and cumin seed, add them in the beginning and before completion. Adjust the taste with coriander powder, cumin powder, salt, lemon juice, soy sauce, and just before you turn off the heat, add 1 to 2 spoonfuls of garam masala. This is it. You may add grated apple or pear, if you like. I recommend letting it sit overnight and serving it the next day. If you heat it up in the morning and evening for a few days, the meat becomes very tender and that's when it tastes the best. Therefore, it takes two days to cook our curry. These days, however, we cannot wait until then and tend to eat in the same day. In my children's evaluation, there are no competitors among the curry restaurants in our neighborhood. It's too bad that I cannot cook the same curry again. I have not yet mastered the ability to make the curry taste the same each time. I am no match for a professional. I always intend to cook a lot and freeze it, but we tend to eat it every day for a few days because I don't have to decide the next day's menu.